A drum brake is a brake in which the friction is caused by a set of shoes or pads that press against a rotating drum-shaped part called a brake drum. The term “drum brake” usually means a brake in which shoes press on the inner surface of the drum. When shoes press on the outside of the drum, it is usually called a clasp brake. Where the drum is pinched between two shoes, similar to a conventional disc brake, it is sometimes called a “pinch drum brake”, although such brakes are relatively rare. A related type of brake uses a flexible belt or “band” wrapping around the outside of a drum, called a band brake. 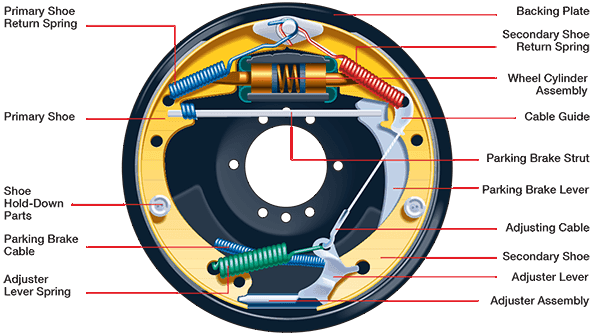 Some of the major components of the drum brake assembly are the back plate, the brake drum and shoe, the wheel cylinder, and various springs and pins. The back plate serves as the base on which all the components are assembled. It attaches to the axle and forms a solid surface for the wheel cylinder, brake shoes and assorted hardware. Since all the braking operations exert pressure on the back plate, it needs to be very strong and wear-resistant. Levers for emergency or parking brakes, and automatic brake-shoe adjuster were also added in recent years. The brake drum is generally made of a special type of cast iron which is heat-conductive and wear-resistant. It is positioned very close to the brake shoe without actually touching it, and rotates with the wheel and axle. As the lining is pushed against the inner surface of the drum, friction heat can reach as high as 600 °F (316 °C). One wheel cylinder is used for each wheel. Two pistons operate the shoes, one at each end of the wheel cylinder. When hydraulic pressure from the master cylinder acts upon the piston cup, the pistons are pushed toward the shoes, forcing them against the drum. When the brakes are not being applied, the piston is returned to its original position by the force of the brake shoe return springs. Brake shoes are typically made of two pieces of sheet steel welded together. The friction material is either riveted to the lining table or attached with adhesive. The crescent-shaped piece is called the Web and contains holes and slots in different shapes for return springs, hold-down hardware, parking brake linkage and self-adjusting components. All the application force of the wheel cylinder is applied through the web to the lining table and brake lining. The edge of the lining table generally has three “V”-shaped notches or tabs on each side called nibs. The nibs rest against the support pads of the backing plate to which the shoes are installed. Each brake assembly has two shoes, a primary and secondary. The primary shoe is located toward the front of the vehicle and has the lining positioned differently than the secondary shoe. Quite often the two shoes are interchangeable, so close inspection for any variation is important. When the drums are heated by hard braking, the diameter of the drum increases slightly due to thermal expansion, this means the brakes shoes have to move farther and the brake pedal has to be depressed further. The properties of the friction material can change if heated, resulting in less friction. This can be a much larger problem with drum brakes than disc brakes, since the shoes are inside the drum and not exposed to cooling ambient air. The loss of friction is usually only temporary and the material regains its efficiency when cooled, but if the surface overheats to the point where it becomes glazed the reduction in braking efficiency is more permanent. Surface glazing can be worn away with further use of the brakes, but that takes time.